Do I still need to purchase an SSL certificate for my site if I am using your SSL form? I am putting a form on my site which will have credit card details entered into it and I want it to be secure for my customers, do I need to have both the SSL form and an SSL certificate or does the form cover the security. Also is there a way of reducing the space between each line? site. Only the data entered in the form are transmitted via the secure socket layer. Other information on the site will not be included in the encryption. 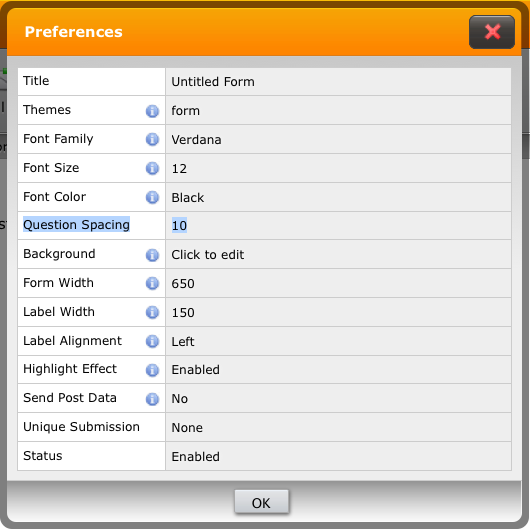 In the preferences section you can change the question spacing. 2. While on the "Setup & Embed" tab, click "Preferences"
5. Click "Close Settings" and save your change. 1. Go to Setup & Embed tab, then click Preferences button. You can change the value according to your needs.